Stretching is a way to get your body ready for exercise and is also a way to improve flexibility at the end of your workout. Your muscles feel relaxed after you stretch properly and this will also help prevent muscle related injuries. Try the following stretches for your upper, middle and lower body. Toning your body is a great way to get your muscles conditioned and strong. 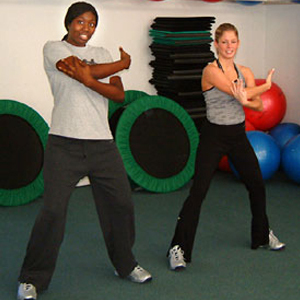 Toning exercises can help raise your metabolism (the way you burn food energy) by building muscle. Certain toning exercises may help prevent osteoporosis by keeping your bones strong. Toning can even help to release stress from your body. Try the following exercises for your upper, middle, and lower body. Stand up straight, with knees slightly bent. Place feet hip distance apart. Make sure toes are pointing forward. Keep shoulders even as you complete this stretch. Place arms behind your back. Clasp your hands together, extending your arms behind your back and hold this position. Feel the stretch in your chest (see photo). Inhale (breathe in) through your nose, and exhale (breathe out) through your mouth, as you complete this stretch. Remember: Keep your back straight (not arched). Continue to breathe. Extend both arms, forming a 90-degree angle between your arms and body. Clasp your hands together, palms facing forward, extending your arms in front of your body and hold this position. Feel the stretch in your upper back. Alternate sitting version: Complete entire sequence from a sitting position. Make sure back is straight. Lift your arms to the side, shoulder height, forming a 90-degree angle between the arms and body. This forms a letter “T” position. Rotate your wrists, so your palms face behind you. Feel the stretch in your biceps. Bend right arm at elbow joint, lift arm next to your head. Position right fingers so they touch the shoulder blade area. Place left arm across top of head, and place left hand on the right elbow to gently support the arm during this stretch. Feel the stretch in your right tricep. Repeat steps 5-10 on the opposite side, using right hand to stretch left tricep. Bend right arm at elbow joint, extend arm across chest. Place left hand on the right elbow to gently support the arm during this stretch. Feel the stretch in your right arm and shoulder. Repeat steps 5-9 on opposite side, using right hand to stretch left arm and shoulder. Alternate sitting version: Complete entire sequence, steps 4-10, from a sitting position. Make sure back is straight and feet are firmly placed on the ground. Lie with your back and head flat against the floor. Bend your knees and place both feet on the floor. Extend both arms to the left side of your body, keeping arms in line with your shoulders. 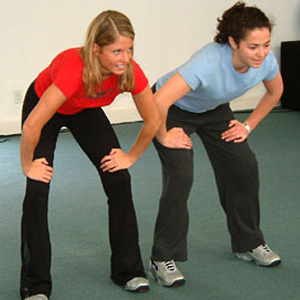 Drop both knees to the right side of your body, by gently lowering your bent knees to the ground. This forms a letter “Z” with your body, like the “Z” in photo B. Feel the stretch in your left abdominals. Repeat steps 3-8 on the opposite side to stretch your right abdominal. Remember: Keep your back straight (not arched). Continue to breathe. Keep your head resting on the floor, instead of in a lifted or arched position. Place both hand on upper thighs, positioning arms with bent elbows. Extend and reach the left arm upwards, directly over the shoulder. Feel the stretch in your left waist and side. 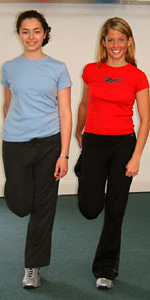 Repeat steps 7-10 on the opposite side, reaching the right arm upwards to stretch the right waist and side. Remember: Keep your back straight (not arched). Continue to breathe. Reach straight up, directly over your shoulder. Leaning or bending to the side may injure your back. Gently arch back, rolling shoulders and leaning forward slightly. Slowly curl your back, forming a letter “C” with your spine, by rolling shoulders forward. Squeeze your abdominals in. Feel the stretch in your back. Remember: Remember to slightly bend your knees. Continue to breathe. Sit on the floor and extend your legs in front of your body. Bend your knees and place your feet together, side by side, flat on the floor. Place your hands on your calves. Slowly let your knees fall open to each side and slide the soles of your feet together. Rest your hands on your ankles. Gently round your spine and roll your shoulders forward. Slowly lean forward, lowering your upper body toward your legs. Stop when you feel the stretch in your inner thighs. Return to starting position by rounding shoulders back and extending your spine to upright position. Remember: Don’t let gravity pull your upper body down too quickly; this might over-stretch your lower body muscles. Continue to breathe. Extend your legs in front of your body. 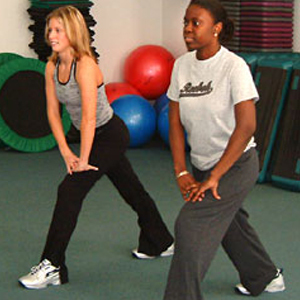 Bend right knee, cross right foot over left knee and place on the floor. Place left elbow on right knee. Keep abdominal muscle tight and back straight. Keep shoulders back and chin up. Place right arm behind your right hip on floor for support. Gently twist waist and shoulders to the right, looking behind the right shoulder. Feel the stretch in right outer thigh. Repeat steps 3-10 on the opposite side to stretch your left outer thigh. Remember: Don’t twist to the side too quickly. Continue to breathe. Keep good posture (your back straight, chin up, abdominals tight). You may choose to hold onto a chair (with one hand) for additional support. Hold abdominal muscles in tightly for additional support. Bend right leg at knee. Grasp right foot behind you, with right hand. Position both knees next to each other. Feel the stretch in right quadricep. Repeat steps 7-13 on the opposite side, bending left leg to stretch left quadricep. Remember: Remember to use your abdominal muscles to support proper posture. Continue to breathe. Straighten your right leg and point your toes. Your leg should be extended about 2 inches from the floor. Your left knee remains bent, with left foot placed firmly on the floor. Slowly raise your right leg toward the ceiling, keeping your leg straight. Slowly extend your leg until you feel a stretch. You will probably feel the stretch when your leg forms a 90-degree angle with your body. Some people are more flexible and can bring the leg in past a 90-degree angle, closer to the body. Feel the stretch in your right hamstring. Repeat steps 3-8 on the opposite side, raising left leg to stretch left hamstring. Remember: Remember to keep your head and back against the floor. Remember to lift your leg slowly when preparing to stretch the hamstring. Continue to breathe. With your right foot, take a large step backwards creating a lunge position. Your entire body should be in proper alignment with your ears, shoulders, and hips forming a straight line. Feel the stretch in your right upper calf and lower calf. Repeat steps 4-8 on the opposite side, to stretch the left upper calf and lower calf. Remember: Remember to stay properly aligned. Continue to breathe. Keep shoulders even as you complete this exercise. 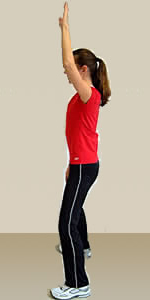 Hold weights at shoulder height with palms facing forward (starting position). Exhale (breathe out) as you slowly and evenly lift both arms upright past ears, above head, to a full arm extension. Inhale (breathe in) as you evenly and slowly lower both arms down to starting position. Repeat exercise for a set of 8. Remember: Do keep your back straight. Continue to breathe. Do move your arms slowly. Do move your dominant arm (your right arm if you are right handed and left arm if you are left handed) at the same pace as your non-dominant arm. Do keep your shoulders even with each other. Hold weights at shoulder height with palms facing forward and elbows bent to form a 90-degree angle (starting position). Exhale (breathe out) as you evenly and slowly move arms together. Keep elbows bent at a 90-degree angle until elbows and forearms meet in front of your face and chest. Now palms are facing each other. Inhale (breathe in) as you evenly and slowly move both arms back to starting position. Remember: Do keep your back straight. Continue to breathe. Do move your arms slowly. Lie with your stomach flat against the floor. Lift feet off floor, bringing heels towards your buttocks. Bend knees to form a 45-degree angle or L-shape. Extend hands next to your body at shoulder height, keeping elbows bent. Exhale (breathe out) as you push your body weight off the floor by extending arms from a bent elbow to straight elbow. Be sure to have proper alignment: a straight back, with ears, shoulders and hips in a straight line. Hold abdominal muscles in tightly (pretend you are squeezing your belly button into your spine). Inhale (breathe in) as you bend elbows and allow your body to lower to floor level. Lower your body until your face is about 2-3 inches from the floor. Remember: Do keep your back straight. Continue to breathe. Do move your arms slowly. Do tighten your abdominals for proper form. Hold weights in both hands, palms facing upward, with elbows positioned next to waist and rib cage. Position arms so weights are directly above thighs and elbows are slightly bent (starting position). Exhale (breathe out) as you slowly and evenly lift both forearms upright to shoulders to a full bicep curl (ending position). Inhale (breathe in) as you evenly and slowly lower both arms down to starting position. Remember to squeeze your bicep muscles as you lift down, instead of letting gravity do the work. Remember: Do keep your back straight. Continue to breathe. Do keep from leaning to one side. Do move your arms slowly, especially as you lower them down to starting position. Place your left arm on your left thigh for support. Hold weight in right hand, working right triceps muscle. Bend arm at elbow, lift elbow back, and hold weight next to shoulder and your underarm. Exhale (breathe out) as you slowly and evenly extend forearm behind your body, moving from the elbow joint so that arm is now straight (ending position). Inhale (breathe in) as you evenly and slowly bring your forearm back to starting position. Remember to squeeze your triceps muscle, instead of letting gravity do the work. Repeat entire sequence on your left arm, steps 1-7 (working left triceps muscle). Remember: Do keep your back straight. Continue to breathe. Do move your arms slowly without swinging them. Do keep your exercising elbow close to your side. Lie with your back flat against the floor. Bend your knees and place both feet on floor. Place hands behind ears, gently supporting your head, but not holding or lifting your head up. Do not interlace your fingers together. 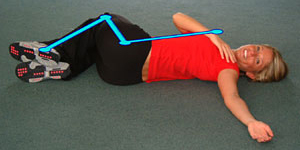 Push your lower spine flat against the floor. Pretend there is a zipper holding your lower spine to the floor (starting position). Slowly lift your shoulders off the floor, using the strength of your abdominal muscles. As you lift, imagine you are squeezing your belly button into your spine (lifting position). Exhale (breathe out) as you lift up. Inhale (breathe in) as you slowly lower your shoulders back to floor (starting position). Remember: Do keep your spine flat on the floor. Continue to breathe. Do move slowly. Rushing to complete a higher number of crunches could injure your back. Do use a controlled abdominal squeeze, without rocking or swinging. Do keep your fingers loose and unlaced behind your head. Place your hands on your upper quadriceps and hold this position for a count of 16. This is an isometric or held muscular contraction. Exhale (breathe out) as you lift and hold while you move your hands from upper quadriceps to behind your ears. Remember: Do keep your spine flat on the floor. Continue to breathe. Do move slowly. Rushing to complete a higher number of isometric sit ups could injure your back. Do use a controlled abdominal squeeze, without rocking or swinging. Do keep your fingers loose and unlaced behind your head. At lifting position, twist to the left by angling right shoulder and right elbow towards left knee. Squeeze the left oblique muscles in your waist and side as you twist. Return to center lifting position. Exhale (breathe out) as you lift and complete the twist. Repeat entire sequence (step 1-10) by twisting to the right and working the right oblique muscles. Remember: Do keep your spine flat on the floor. Continue to breathe. Do move slowly. Rushing to complete a higher number of alternating obliques sit ups could injure your back. Do use a controlled abdominal squeeze, without rocking or swinging. Do keep your fingers loose and unlaced behind your head. Hold weights in each hand, with arms extended by your sides. Slightly bend your elbows. Place arms so that the held weights are in line (next to) with your hip/leg area. Grip weights so palms face behind you (starting position). 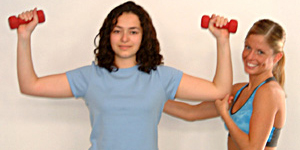 Slowly and evenly lift right arm in front of body with a full arm extension, until your arm reaches shoulder height. Be sure to keep elbow slightly bent. You are working your right Latissimus Dorsi & Deltoid. Exhale (breathe out) as you lift arm up. Inhale (breathe in) as you evenly and slowly lower arm down to starting position. Repeat entire sequence on your left side, step 1-10 (working left Latissimus Dorsi & Deltoid). Lie on your left side, flat against the floor. Rest your head on your left upper arm. Bend your right (top) leg at the knee and cross over in front of left leg. Rest your right arm on your right hip. Keep your left leg straight. Using inner thigh muscle (adductor), lift left leg 6 inches off floor. Keep left toe in flexed position (not a pointed position). Exhale (breathe out) as you lift your leg. Inhale (breathe in) as you lower your leg. Remember: Continue to breathe. Do use a controlled adductor squeeze, without rocking or swinging your leg. Do keep your body straight and your hips aligned (one on top of the other). Using outer thigh muscle (abductor), lift right leg 6 inches off floor. Keep right toe in flexed position (not a pointed position). Using resistance with the outer thigh muscle (not gravity), slowly lower your leg. Repeat entire sequence on your right side, step 1-9 (working left abductor muscle). Remember: Continue to breathe. Do use a controlled abductor squeeze, without rocking or swinging your leg. Do keep your body straight and your hips aligned (one on top of the other). Lift right leg up to hip height by bending right knee. Squeeze right quadriceps muscle and supporting abdominal muscles. Clasp hands in front of chest. 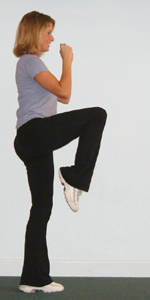 Extend lower leg (knee to calf) straight forward with a kick motion. Exhale (breathe out) as you kick. Inhale (breathe in) as you lower your leg to the floor. Keep abdominals tight as you complete this entire exercise, to support back posture and maintain proper form. Repeat entire sequence (steps 1-10) with left leg using left quadriceps muscle and supporting abdominal muscles. Remember: Do keep your back straight. Continue to breathe. Do avoid leaning to one side as you kick. Do squeeze your abdominal muscles. Bend elbows and hold both arms in a boxer position. Maintain proper back alignment—with ears, shoulders and hips in a straight line. Sit in a squat position by bending your knees and squeezing your quadriceps muscles. Pretend you are sitting in a chair. Lower your body past the sitting position for a more advanced exercise. Balance your body weight by pressing your weight through your heels, not your toes. Be sure to keep your knees over your ankles, not past toes. Inhale (breathe in) as you squat down. Exhale (breathe out) as you stand back up, squeezing your hamstrings and gluteus muscles. Remember: Do keep your back straight. Do keep hips, shoulders and ears aligned. Continue to breathe. Exhale (breathe out) as you lift your heels off the floor by standing on your toes and squeezing your calf muscles. Raise your heels 2 to 5 inches as you lift. Inhale (breathe in) as you lower your heels back to the floor. Repeat exercise for set of 8. For added resistance, hold weights on shoulders (this is optional). Remember: Do lift your heels no more than 5 inches. Do use a controlled lifting motion, without swinging or bouncing. My friend was using some of these exercises to get in shape for their Police Test Prep and told me about how helpful these exercises were and how they contributed to her success.